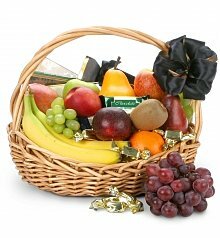 Send the gift of health with our fresh and nutritious get well fruit baskets. What better way to buoy someone’s health than with nature’s medicine, fresh fruit? Loaded with naturally occurring vitamins and antioxidants, the fruit found in get well fruit baskets is nature’s cure for the sniffles, the blues, and so much more. Just one orange contains over 116% of one’s recommended daily intake of Vitamin C while a few slices of pineapple are loaded with essential micronutrients like Manganese, Niacin, and more. All of these healthful nutrients found in get well fruit baskets work with the body to overcome illnesses by empowering the immune system and making the body stronger as a whole. 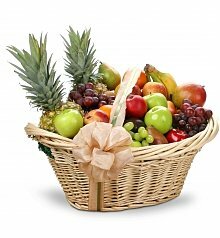 For these reasons and more, get well fruit baskets are the ideal gift for anyone looking to overcome an illness or recover from a surgery. The baskets are especially appreciated, too, if the patient is unable to physically go to a store or market to purchase the fruit for themselves. 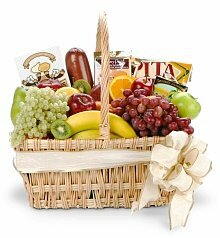 Get well fruit baskets are simply a great gift to provide any patient with the essential nourishment their bodies need and crave. 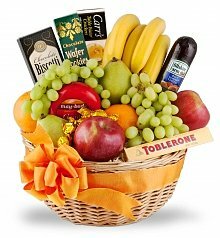 Get well fruit baskets are both vibrant and colorful, making them the perfect gift for lifting spirits. 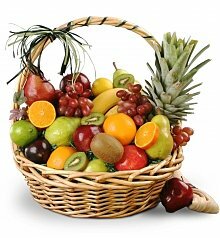 Much like a flower bouquet, get well fruit baskets are picturesque and multicolored for a beautiful culminating effect. After all, just think of all of the still life paintings of fruit you’ve seen in your lifetime! Fruit has a universal appeal and an innate beauty that makes it the perfect display for a hospital room, kitchen, bedroom, or any living space. When you combine all of the textures, shapes, and colors of get well fruits, the effect is an intensely beautiful display of nature’s bounty. Best yet, every time the patient will gaze at your get well fruit basket, they are sure to think of health and new life - as well as your generosity. Keep their spirits high and their body well-nourished with a get well fruit basket overflowing with grapes, bananas, pineapples, pears, and so much more. It’s a gift whose gesture is sure to make them smile and feel better with every gaze. 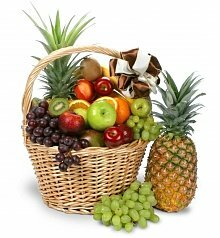 Summer, spring, fall, or winter, the fresh seasonal fruit found in get well fruit baskets can be enjoyed all year long. Get well fruits that are in season during the summer include peaches, watermelon, and blueberries while get well fruits that are ripest during the winter include oranges, tangerines, and grapefruit. No matter what the season, however, fresh fruit tastes great anytime. 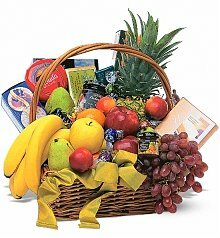 During the winter months when many varieties of fresh fruit are not as readily available, imagine the recipient’s surprise to receive a get well fruit basket and to bite into a juicy banana imported from the tropics! 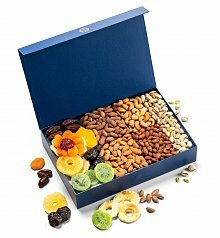 Our get well fruit baskets contain both domestic and tropical fruits so that the recipient will find their favorite fruit regardless of the season. From grapes to mangoes, our get well fruit baskets contain the freshest, ripest fruit obtained from the best seasonal sources and destinations.